Strong treatment for persistent problems in fish. 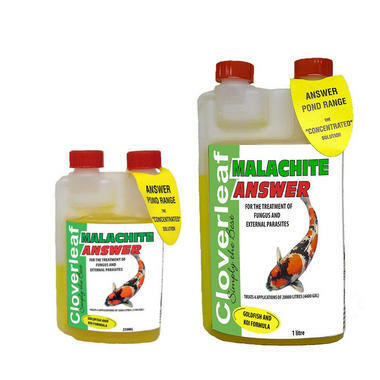 Over time Pond fish can develop Fungus and Parasite based infections, Cloverleaf Malachite Answer has been designed as a effective treatment for persistent problems. Cloverleaf Malachite Answer is a strong treatment for ongoing Fungus and Parasite infections in fish. The treatment can be used when the fish are plagued with constant "cotton wool" shaped fungus. It can also be used if the presence of Parasites like White Spot, Skin Flukes, Costia and Chilodonella have been detected in the fish. 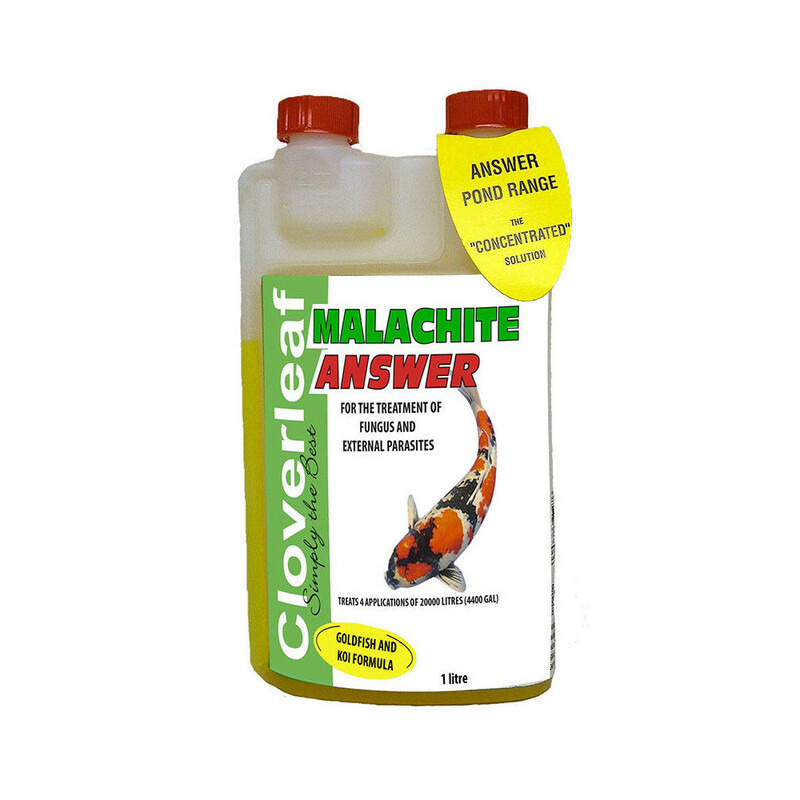 Malachite can also be used with Cloverleaf Formaldehyde Answer as a powerful and stronger based treatment. 4. Squeeze the sides of the bottle until the required amount fills the dose chamber to required measure. 5. Add dose chamber contents to half a bucket of pond water, repeat until correct amount has been added to the bucket. 6. Gently stir to evenly mix in the bucket. 7. Spread bucket contents evenly around your pond. Once a full course of treatment has been completed do not repeat for 7 days, if symptoms persist we recommend you re assess the original diagnosis before re treating with a follow up dose. Do not mix treatments leave at least 7 days between last completed treatment course. Some products can be used below 10°c however the metabolism of disease organisms is reduced and treatment may take longer. Any discolor to the water will usually biodegrade over a few days. 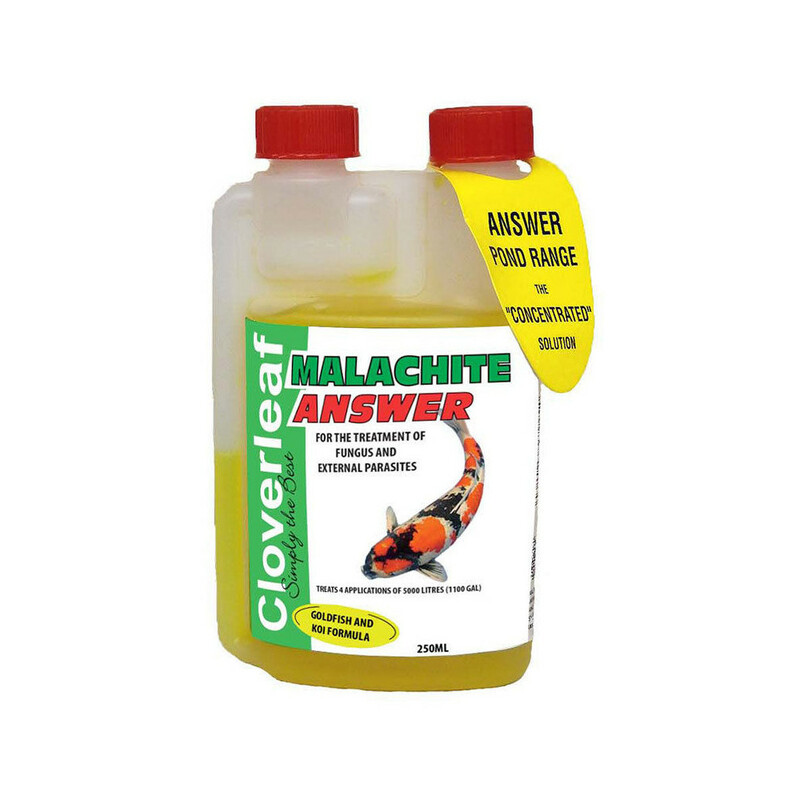 Use Malachite Answer as a stronger treatment for parasite problems at a rate of 50% normal dose rate of Formaldehyde Answer to 50% normal dose rate of Malachite Answer.